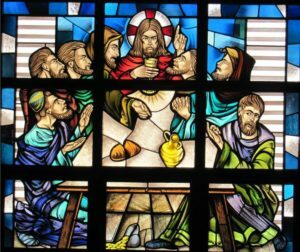 The Eucharist is the sacrament through which Christ the Risen Lord continues to offer himself to us so that we, the Church, might grow in faith and love, empowered to be Missionary Disciples who work tirelessly in proclaiming and building God’s Kingdom. Our celebration of the Eucharist is the memorial of the Lord’s death and resurrection in which the sacrifice of the cross is perpetuated over the centuries; it is the summit and the source of all Christian worship and life; it signifies and effects the unity of God’s people and achieves the building up of the Body of Christ. The other sacraments and all the works of God’s people are closely related to the Holy Eucharist and are directed to it (Canon Law 897). Our parish’s First Communion Program takes place on Sundays. It involves the entire family (parents, the children preparing to celebrate First Eucharist, other siblings needed Faith Formation) and includes three essential elements: Participation at the 9:30 a.m. parish mass with your family; breakfast with the other families who are enrolled in the Sunday program; breakup into various groups/classes designed for the children as well as the adults. The Sunday session ends around noon. Adults interested in participating in full communion with the Catholic Church are invited to participate in the Rite of Christian Initiation for Adults. Contact Fr. Chris by phone (631-585-8760 ext.211) or email (pastor@abvmcentereach.com) for more information. If you or a family member cannot attend Mass and would like to have the Eucharist brought to your home please contact the rectory by email (rectory@abvmcentereach.com) or phone (631-585-8760).